The first time I was in Kolkata, it was in January 2018. I was there only for a night, and wherever I went, I kept spotting these posters. They intrigued me. I had found at least five different ones on a small walk from my hotel in Shakespeare Sarani to the legendary Mocambo hotel. On the street outside Mocambo, Kolkata. The second time I went to the city was in the rainy days between June and July, spending close to ten days there. This time, I actively looked out for the posters that caught my eye the last time and stayed etched in memory. Upon following them, I realized they followed a model: A few stock photos of young girls, a familiar very-effeminate name, and the promise of a satisfactory or ‘exsiting’ massage, occasionally peppered with bold pronouncements of luxuries like an AC. I wondered what sense of aesthetic runs through the mind of the poster designer and the poster chipkane-wala. I also wondered, as to what prompted a certain poster to be put in a certain way at a certain public spot. At ad agencies, graphic designers and copywriters push the idea that their advert-poster for a daily-use product like detergent is art. It waits to win a Lion at Cannes or an Abby from The Advertising Club. But does this guy— the one who makes these posters that are pasted up haphazardly through Kolkata’s many streets — holed up in cyber cafe somewhere or at an offset printer, think of his creation as art? Or will this aesthetic be qualified with the tag of art only when a kitschy reproduction of it is displayed at an art fair or an event such as Indianama? In trying to take these photographs, I was trying to explore if these posters are art in themselves. For the street-hustler or a tired stock trader stumbling home drunk, the pop-neon colours of these posters catch his eye and promise a communion with these monochrome beauties. 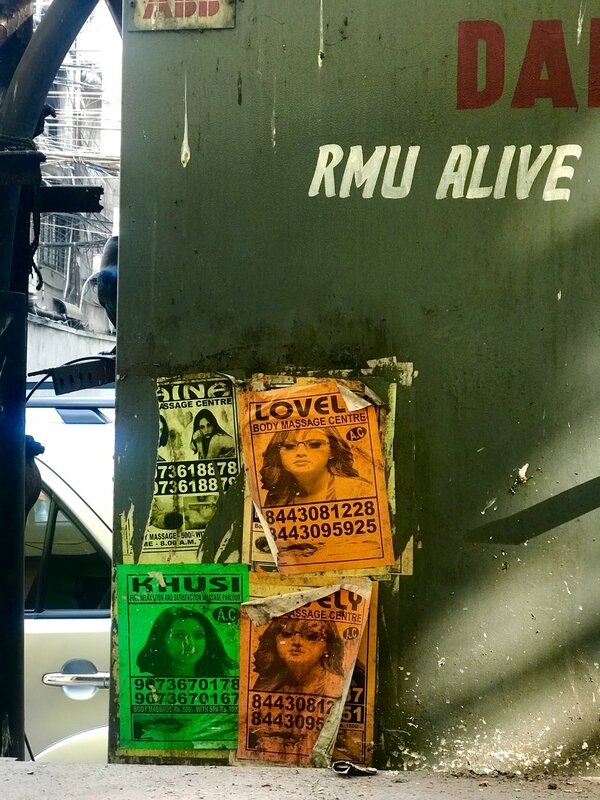 Does this inebriated man take a second to perceive beauty or art in these posters while dialing "Aeisha" or "Khushi" for a “full relaxation massage”? What sort of beauty is he after? The places where I find these posters in Kolkata are not even the shady or mofussil parts of the city where one expects certain kinds of activities to take place. They’re ubiquitous from Shakespeare Sarini, to Mirza Ghalib Street and to the famous Park Street in Kolkata— all on a stretch of roads that houses a Starbucks, an Apple Store, the famous Park Hotel, and cultural institutions like Alliance Francaise, Goethe Insitut and the Oxford Bookstore. I continued taking pictures of these posters like it was a never-ending personal project. But when I spotted the last pcture at the corner right after the Starbucks on Park Street, I stopped. It ties up the apparent with the inglorious truth that lurks around the corner. Are these missing girls an unfortunate consequence of this trade or a dark side or the reason? Sahaj Umang Singh Bhatia is an independent filmmaker-visual artist from New Delhi, with a background in theatre and acting.